Two available, $40 each or $75/pair. 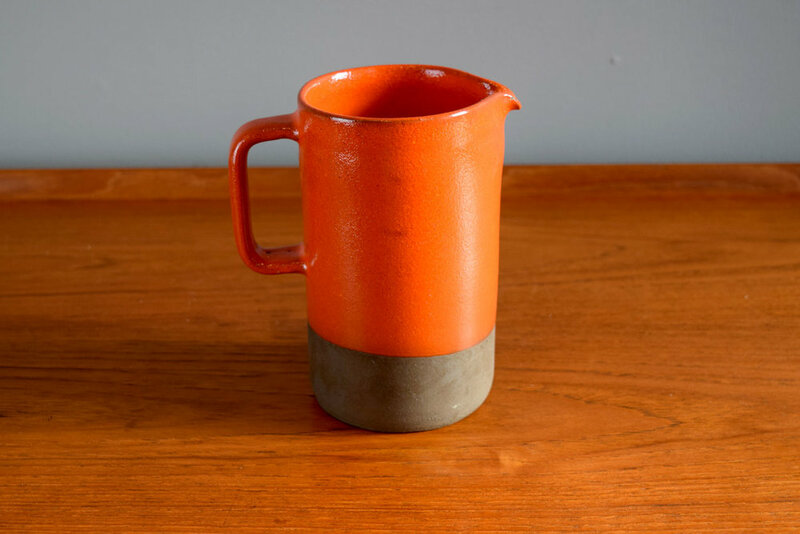 This is such a great modernist stoneware jug. 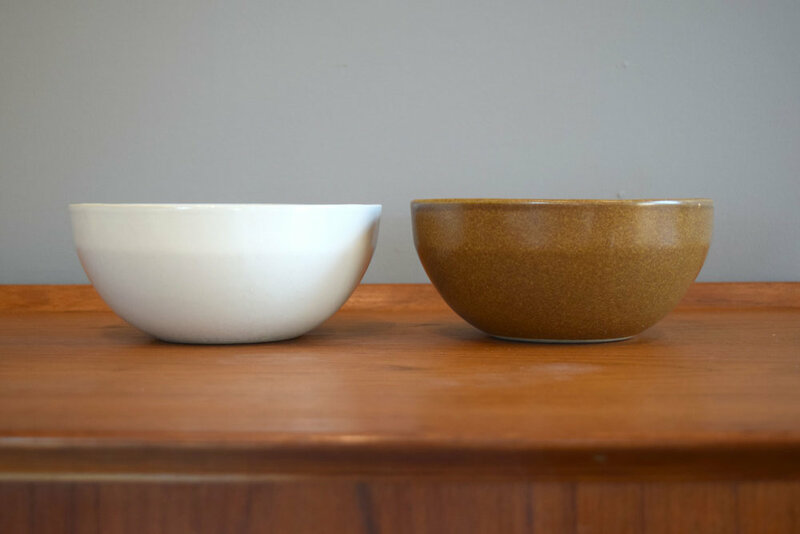 I love the contrast between the unglazed earthenware bottom and the richly glazed top. It is earthy and mod and totally wonderful! 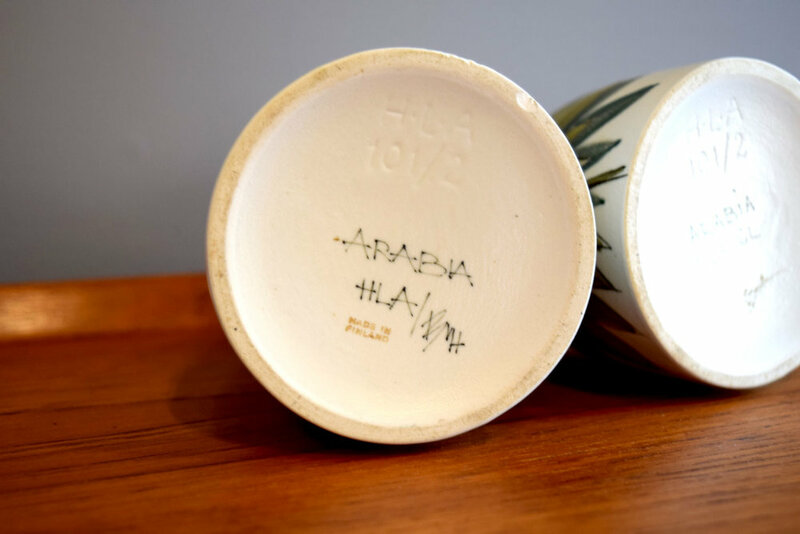 Abbednæs Keramik was a small studio west of Copenhagen and pieces from their artists are very hard to find in the US. 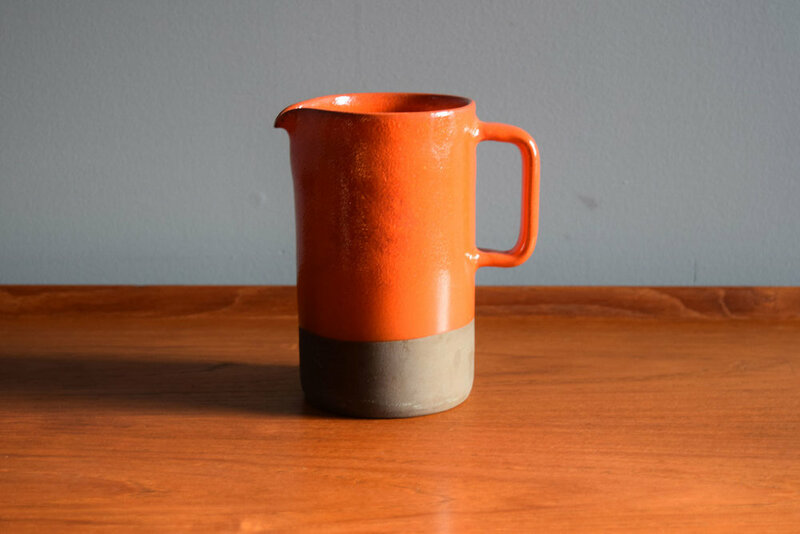 Excellent vintage condition with one tiny glaze chip on the spout and some light scuffs to the unglazed portion. This sweet pitcher and cup set was produced in Ecuador. Handmade, hand painted, and signed. 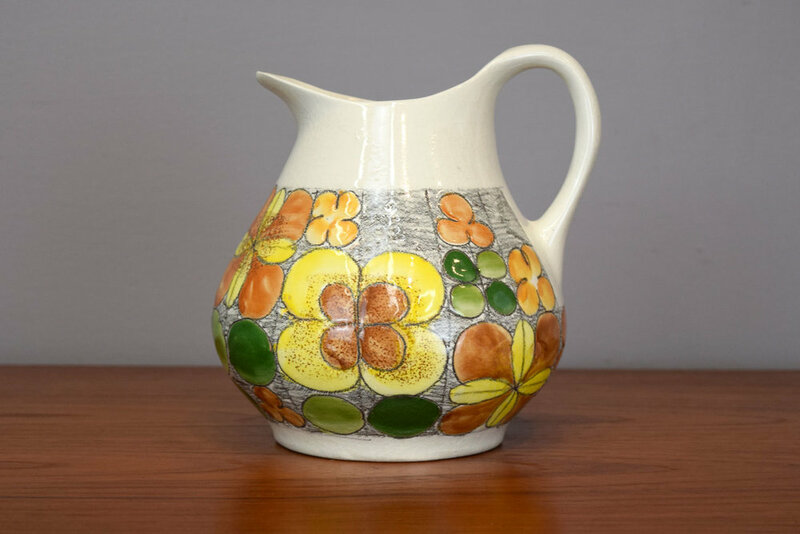 In very good vintage condition with glaze crazing throughout. 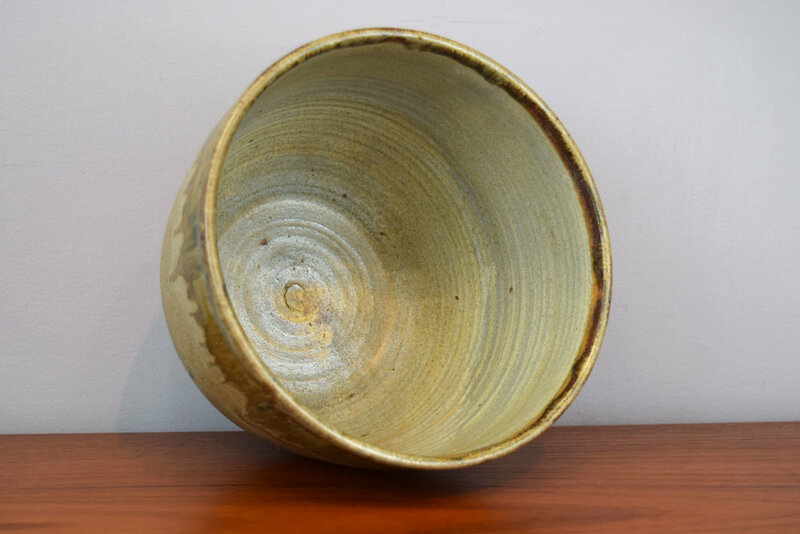 A nice handmade stoneware dish with great graphic glaze design. One very small chip on the edge as shown. 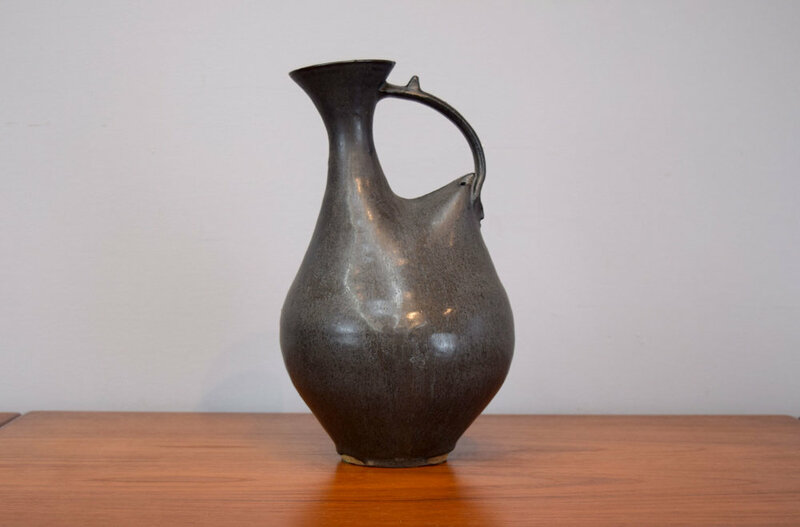 An outstanding modernist studio art pottery stoneware jug by Jack O'Leary (1918-1982) of Tariki Studio, New Hampshire. 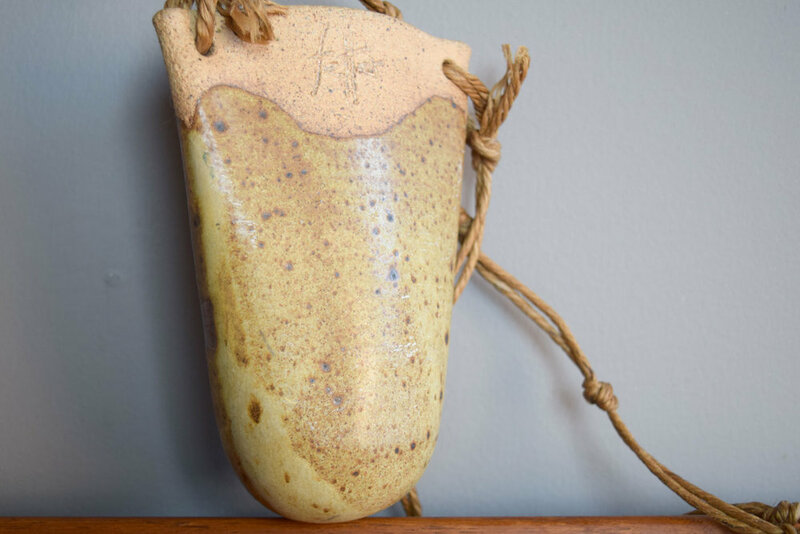 This vessel has a wonderful, near figural form (like a modernist bird!) 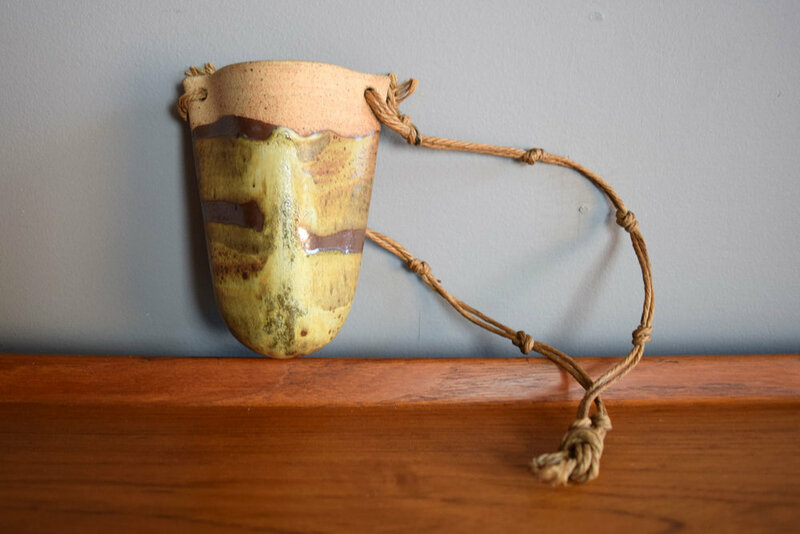 Hand-thrown and altered with an arching applied handle with thumb tab. 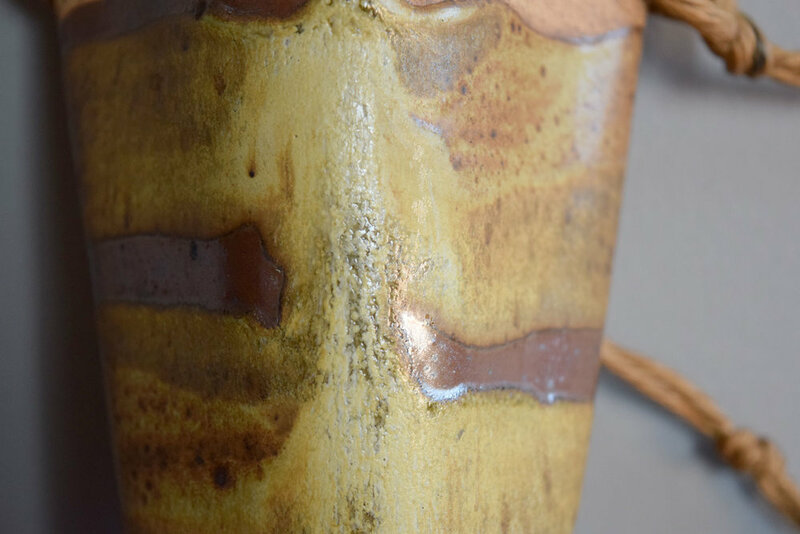 Finished with a mottled tenmoku/wood ash glaze. Signed "Tariki" to the foot, undated. 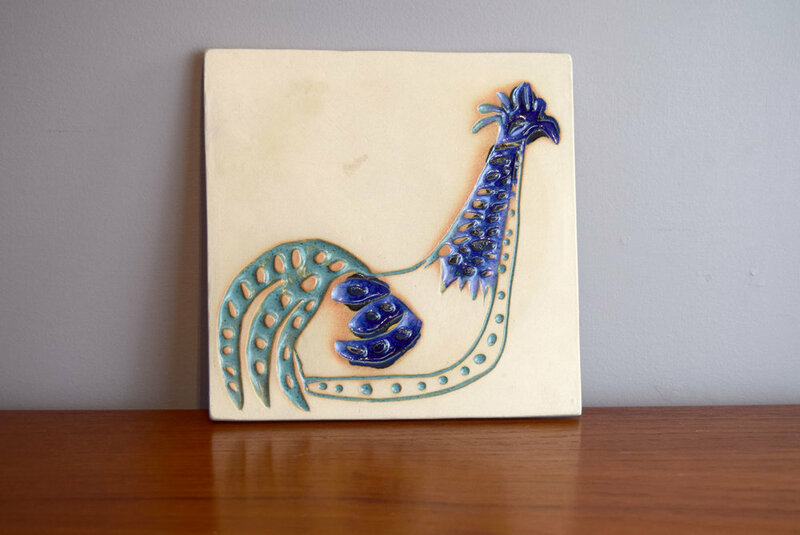 This is a great mid-century art tile by Bennington Potters Collective in Vermont. 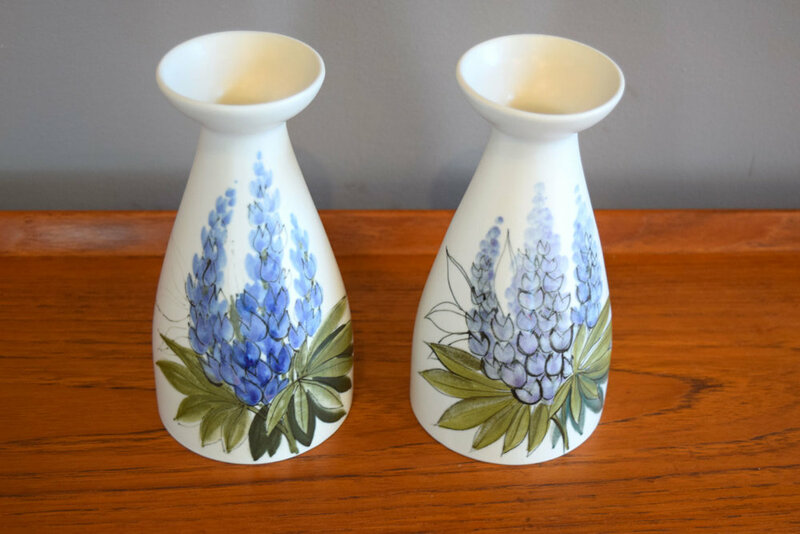 In excellent vintage condition with feet for use as a trivet and a loop for wall hanging. Arabia Finland's 1970 'Ruija' (Troubador) pattern. 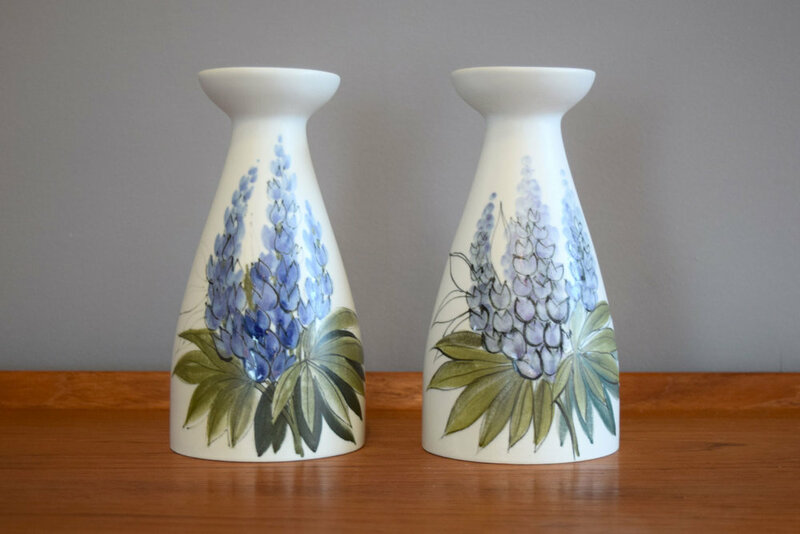 Decoration by Raija Uosikkinen, form by Ulla Procope. This piece has a large repaired crack on one side. Wonderful, whimsically decorated fine porcelain cup, saucer and plate set from the 'Emilia' pattern by Raija Uosikkinen for Arabia, Finland. Designed in 1957. 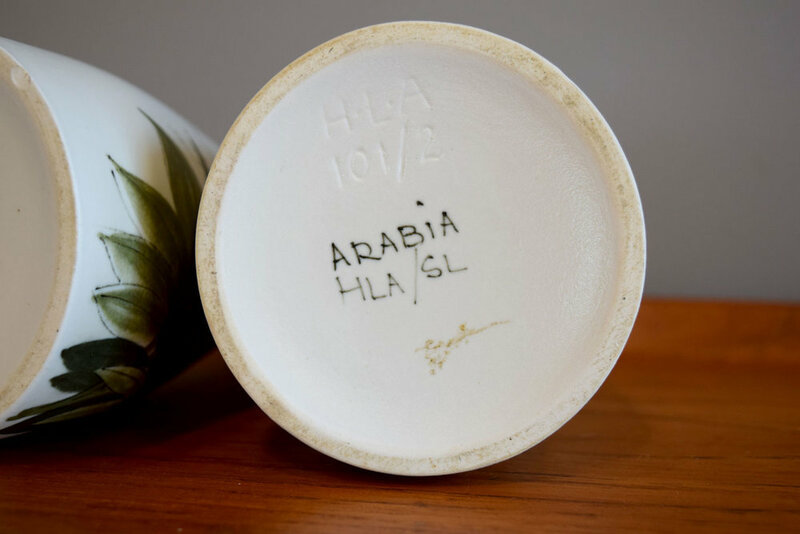 In excellent vintage condition with only minor glaze crazing on the cup. 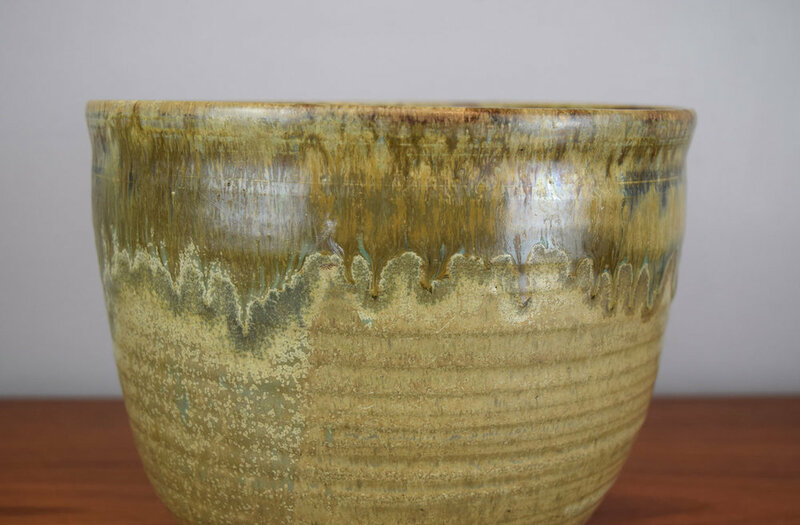 Cup 3.675" x 2.75" x 3.75"
Beautiful glaze. Signed CM. Excellent. 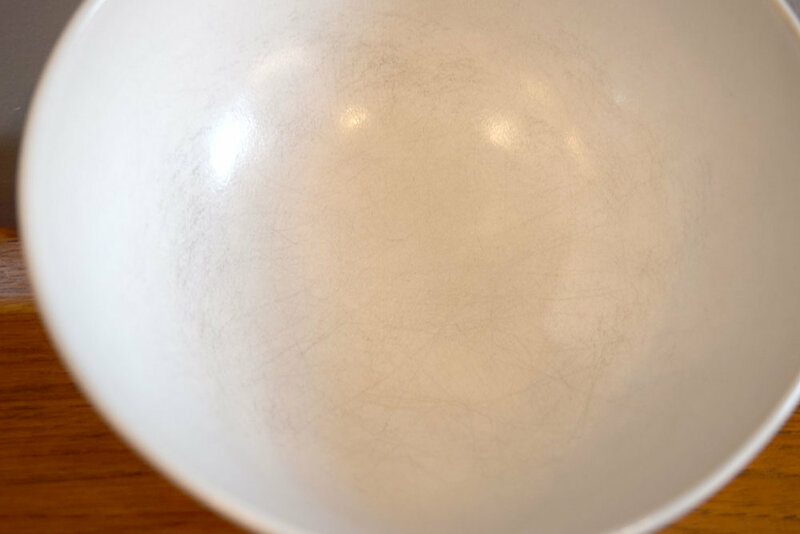 A beautiful hand-thrown small bowl signed by the potter. Excellent. 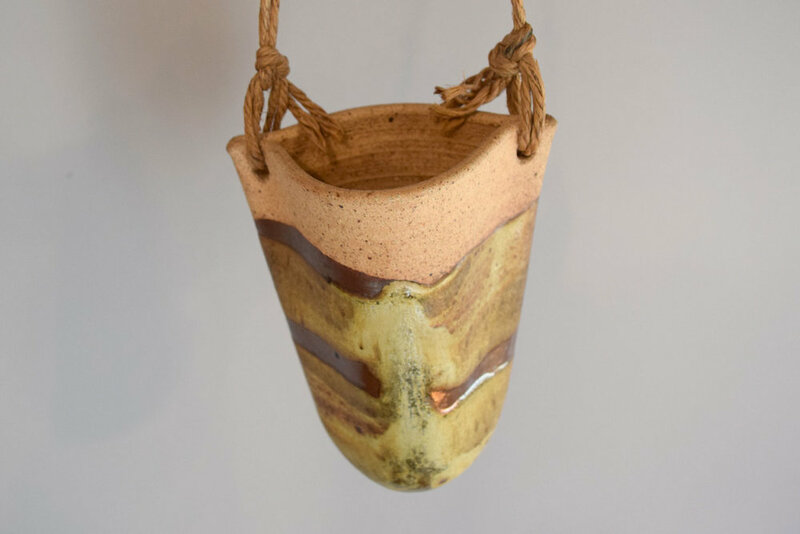 4.5" x 4.25" x 3.25"
This is a really nice studio art pottery pitcher, signed by the artist. 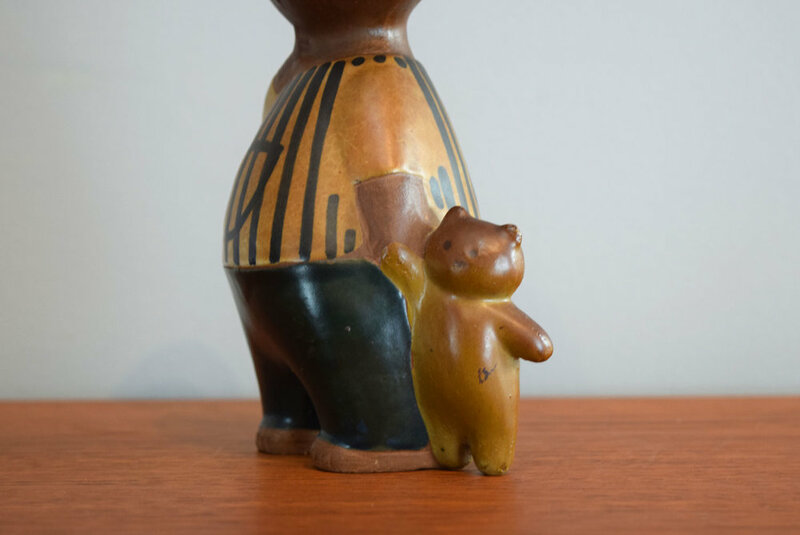 I was told that this is by Arne Bang, the highly collectible Danish potter Arne Bang, but I have not confirmed this. The signature is the same, but the style is a bit different. Either way, it's a beautiful piece! 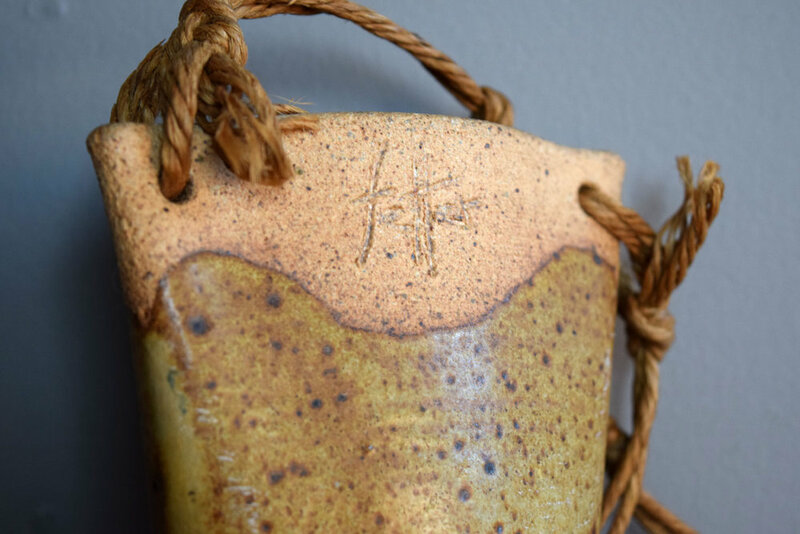 6" x 5" x 6.5"
A sweet studio pottery vase, signed by the artist. Excellent condition. 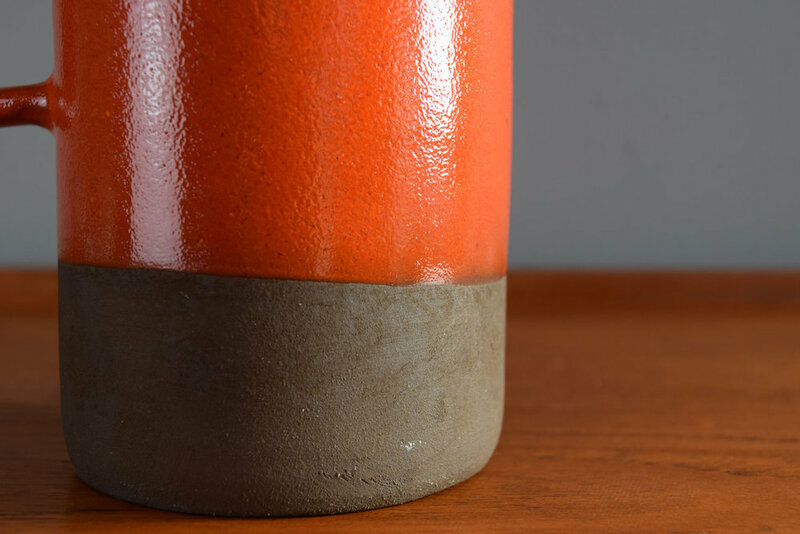 A lovely, signed studio pottery vase in beautiful varied greens. 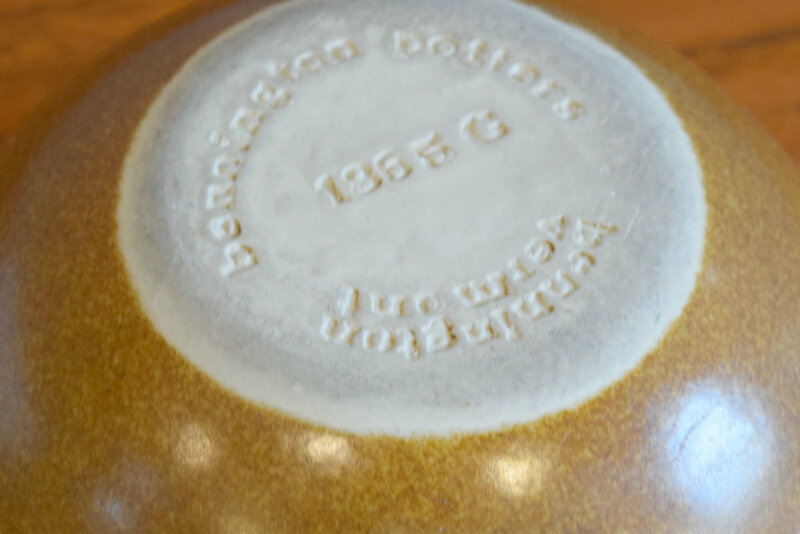 Signed with impressed potters mark. Excellent condition.